Pulled up next to a bed, this nightstand gives your child great functional storage space and provides the perfect place to set down a lamp for bedtime reading and a place to keep a glass of water nearby. This night stand has three drawers which provide plenty of room for bedtime story books, reading lamps, alarm clocks, anything else your child wishes to store. 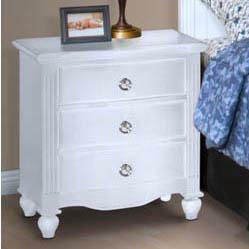 The Victoria 3 Drawer Night Stand by New Classic at Michael's Furniture Warehouse in the San Fernando & Los Angeles area. Product availability may vary. Contact us for the most current availability on this product. The Victoria collection is a great option if you are looking for Traditional furniture in the San Fernando & Los Angeles area. Browse other items in the Victoria collection from Michael's Furniture Warehouse in the San Fernando & Los Angeles area.